Admittedly, these crepes were a bit hard-fought to get on the table but it was worth it. I found them a bit tricky to flip but once I got the hang of it - letting the pan gets nice and hot, and allowing the crepe to fully cook through before flipping - I managed to serve these oatmeal crepes for a weekend breakfast. Weekend breakfasts and brunch are special, no matter what we're eating. That time around the table is something I look forward to all week! And I love trying something new so I can talk about it here. This time, I thought I'd make oatmeal crepes. 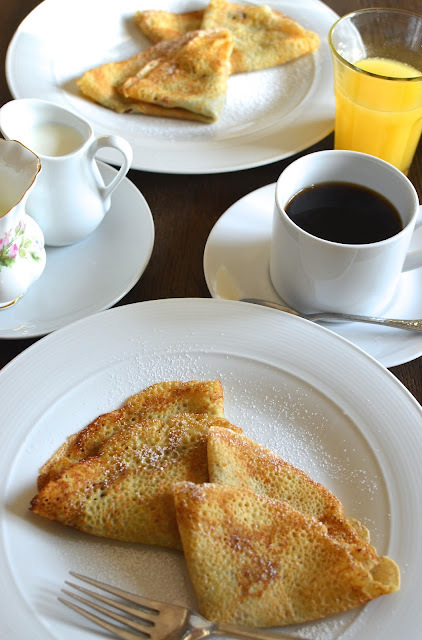 We all know and love crepes but I was especially drawn to this recipe from Lidia Bastianich that incorporated oat flour for a little touch of nuttiness and texture. I made oat flour by simply grinding old-fashioned oats until very fine (almost powdery) in a processor. This addition of the oat flour, with regular all-purpose flour, is what sets these crepes apart (and what likely contributes to them being more tricky to handle/flip). Additionally, fresh lemon zest adds a great pop of citrus flavor. With the lemon, these crepes pair nicely with jam. I tucked strawberry jam into some and filled others with Nutella. As with others crepes, these are perfect little holders for the fillings you tuck within. Texturally, these stand out with the slight nuttiness, along with a great crispy edge. With the liquid in the recipe being water, they are fragile. I may have lost a couple of crepes in the making but they were so tasty, my husband wished I'd saved the scraps and allowed him to have those, too! Typically when I'm making crepes, I'm looking for a smooth batter that's the consistency of thin cream. It will be different in this case. As you can see below, this crepe batter, with the coarser oat flour, will be thin and a bit grainy. Use a 10-inch non-stick skillet and heat it over medium-heat. Grease it thoroughly by brushing it with olive oil. Allowing the pan to heat properly and evenly will allow the crepes to cook throughout so it's easier to flip and give it a nice crispy edge. I found it really helped to let the crepe cook/set thoroughly on the first side, so it's firmer and sturdier, before flipping over. If necessary, turn the heat down slightly. I made a half recipe, and using a 1/3-cup measure of batter per crepe, yields up to 8 crepes. Even if you don't need quite so many crepes, consider whipping up the full original recipe (sited below) so that you have extra batter to work with. It might take a crepe or two to get the hang of flipping these. I'm so glad these were worth the effort. Ours were gobbled up quickly! In a large bowl, whisk together the eggs, water, vanilla extract, and lemon zest. Whisk in the oat flour, all-purpose flour, and sugar until smooth but don't overmix. Whisk in the butter. Place a 10-inch nonstick skillet over medium-high heat. Brush pan evenly with olive oil. When the pan is hot, ladle in 1/3 cup batter, quickly swirling the pan in a circle motion with your wrist to spread the batter evenly around. Cook until brown on one side, about 1 minute (I find it best to let the crepe cook thoroughly so that it firms up and becomes easier to handle; adjust/lower the heat if necessary). Use a spatula and carefully flip the crepe over to the other side. Cook for about 15-30 seconds, then remove crepe to a plate. Repeat with remaining batter. I keep the crepes warm in a 200 degree oven while cooking the batch. To serve, fill each crepe with about a tablespoon or so of filling. Fold it into quarters, dust with confectioners' sugar and serve immediately. These crepes look really nice - using oat flour is a nice change. What a lovely weekend breakfast. HI Monica, breakfast sounds like a wonderful time at your house, you always prepare something special. Gorgeous looking crepes, love the texture. Lidia's recipes are the best. Hope you are having a wonderful 2017. These crepes look fantastic, Monica. A really great meal to start the day. A great little weekend breakfast. Thanks, Angie. How wonderful - oats in the batter - I love it! They are just beautiful and I can only image how delicious they would be with Nutella. Yummy :) Hope you're still enjoying your new kitchen! It works nicely in pancakes and now I know it can be done in a crepe! We are definitely enjoying the kitchen...thank you, Tricia. It's nice to try something new once in awhile amidst all the old favorites and standbys. Thanks, Kelly. I can totally picture you making some gorgeous crepes, holding some wonderful vegetables inside. What a great brunch that would make!! I've never made crepes at home and you have totally inspired me now! "Scandalously" delicious is high praise! Thank you!! I love oats and I make oat pancakes, but never tried crepes. These oatmeal crepes look oatlicious, Monica. What a perfect treat to kick start a lazy morning. I do love oats - the best! I wanna have brunch at your house - these look great!! I love, love eating crepes for breakfast! They look terrific! Gotta love oats, Juliana. Thanks! What a great idea for crepes. We love crepes and pancakes of any kind, but I don't think I have ever made them with oatmeal. They look so lacy and pretty. It is one of my favorite meal, i love it. Thanks for the recipe.